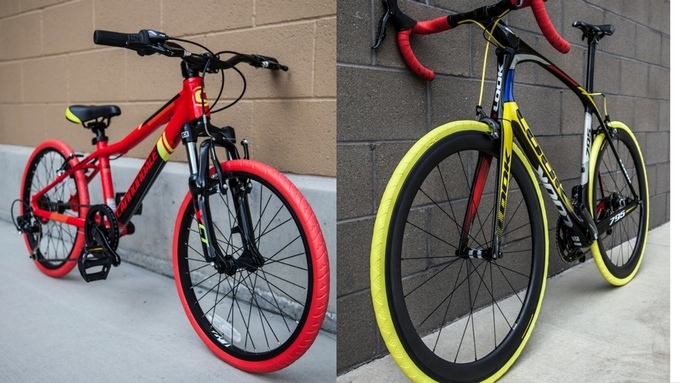 Two new lines of bike tires are trying to make sure that riders never have to worry about getting a flat. When it comes to cycling, whether you have a high-end ride or cheap beater, bike tires are most often the weakest link. Getting a flat is never fun, especially when you’re out on the road, are miles from home, and you don’t have a patch kit. In general, bike tire technology (outside of the super-cool eBike stuff) has been relatively stagnant for a while, so it’s refreshing to know that a few startups are giving innovation in the space a good spin. Like this one. Nexo Tires and Ever Tires never get flat. They’re made of custom materials; neither model uses liners or rubber or foam or gooey solutions. Or even air for that matter. Nexo bike tires are solid and made of NEXELL, a trademarked macromolecular material. Half of the tire interiors are filled with nitrogen—that helps to keep the weight 40% lighter than traditional flat-proof pneumatic tires. The tires also feature a patented T-Bolt safety device to prevent rim-out and tire twisting. Ever Tires, on the other hand, are engineered with a series of holes that are engineered to deliver a smooth ride while maintaining a substantial level of control. The single-stage manufacturing process means these tires can be created in 30 minutes a piece, a significant improvement over traditional rubber tire manufacturing which requires several steps including mastication, vulcanization and the addition of chemicals for durability. One notable drawbacks of the Ever Tire bike tires is that each one requires a specialized rim to accommodate the proprietary airless design. While the cost of the rim is included in the product pricing, there’s currently no option to purchase the tires alone. Both lines of tires are rated to last 5,000 miles flat-free, which is long enough to ride from San Francisco to Washington, DC and back again (road trip!). It’s worth noting, however, that while the tires are engineered to withstand sharp objects and take a general beating, they’re not made for skidding or extremely hot temperatures. Whether you’d want to use these tires for trail riding or racing is one question to consider. With the solid tires, there is a relative lack of cushioning as well as 10% to 15% more drag over conventional bike tires. That being said, if you’re not doing either in a competitive (or highly repetitive) manner, you’re probably good to go. The Nexo tires come in the following sizes: 20×1.35 (370g), 26×1.5 (720g), 26×1 3/8 (530g), 27.5×1.35 (579g), 700x24c (530g), 700x35c (630g). While the tires weigh slightly more than conventional air tires, presumably in the long run, the marginal increase in weight is offset by the fact that you never need to carry a pump or extra tube (and perhaps the relief of psychological weight or worrying about tire damage). The company is just about to crack the $24,597 goal of their Kickstarter campaign; almost 150 people have backed the product and there are still more than 3 weeks to go. Early-bird pricing for the bike tires starts at $75, a 50% discount off the expected retail price of $150. Currently, the makers aren’t shipping outside of the US due to high shipping costs, but they expect to get their first batch out in January of 2017. Do you have mountain bike tire for winter riding saskatoon saskachewan prairie province. I was a backer before reading this and I would encourage everyone here to take a look at the campaign. The company truly wants to change something that has been unchanged in this dynamic for so many years. Good luck to them! When you put some good money into a bike, the tires are usually a commonly high expense that happens often. Having a tire that claims to never need air, I would like to give it a try. I wonder what the life cycle of one of these is for the every day rider. I bike everywhere! Where I live allows for that year round and I would really like to try something like this to see how they work. Even knowing they might not be ideal for the every single day rider, the cost savings might be worth it. A good price for a product that will last is pretty enticing for a person that might bike every single day. I wonder how these types of tires will react in the rain or snow.